The oddly named Lunt Roberts has proved a little bit of a mystery. He was active between 1913-64 according to some sources, illustrating magazines, children's books and annuals. 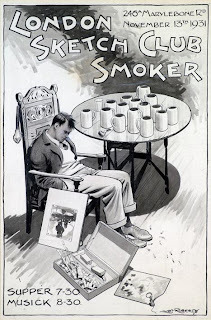 According to David Cuppleditch's London Sketch Club, Roberts first attended the London Sketch Club with John Hassall in 1913, became a member in 1921 and was made president in 1936. His work appeared in Punch, The Humourist and The Daily Mail Annual amongst many other publications. He served during the Great War with the Welsh Fusiliers. During World War Two he supplied illustrations to the Ministry of Information. A sketch book belonging to Roberts was sold at Christies in the mid-1950s with various drawings turning up on e-Bay at times, including the blowing up of the French battleship 'Liberte' in Toulon harbour (on the reverse was a watercolour sketch of Lake Maggiore). He will probably be most associated with Richmal Crompton's character Jimmy and the 'Jilly' series by Malcolm Saville. 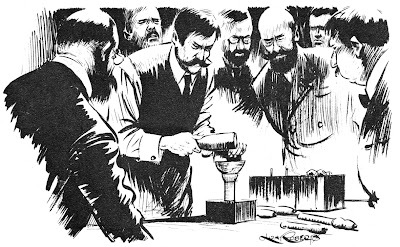 There's an odd note in Dictionary of British Book Illustrators that says "He lived in South London and every year drew a portrait of the new Captain of the Coombe Wood Golf Club," and therein lies the clue to why nobody seems to have been able to dig up much information on Lunt Roberts. 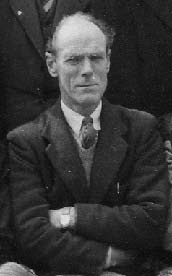 One of the members of the club in the 1930s was one R. J. Lunt-Roberts. Hopefully our artist. And a Rob J. Roberts is listed in the London phone book as a "creative commercial artist" of 3 Hillside Road, Streatham S.W.2 in 1927 and as "artist" at the same address in 1930. R. J. Lunt Roberts is listed in the phone book for 1932 at 22 Kemplay Road, Hampstead N.W.3 in 1932 (with no sign of Rob J. Roberts but no occupation given either). All of this makes me suspect that Lunt Roberts' full name was Robert J. Lunt Roberts (possibly hyphenated). Unfortunately, I can't find anyone in the available birth records with those three initials and a search of the 1901 census turns up over 1,200 people named Robert Roberts and none usefully listed as Robert J. L.
I've searched the death records between 1963-69 and there are many Robert J's but no Robert J L's so I've hit a bit of a brick wall. Rob. J. Roberts turns out to be a red herring. I finally found Lunt Roberts' death registered in 4Q 1981 in Kingston Upon Thames. He was Richard John Lunt-Roberts, born in Secunderabad, India, on 28 August 1894, the son of Richard Roberts and his wife Gertrude (possibly nee Lunt). His father was Welsh, his mother Australian, and he was the first of at least three children. In 1901, the family were living in Aber, Caernarvonshire. He served during the Great War with the Royal Welsh Fusiliers. He lived at some point (early 1920s?) at 30 Kemplay Road, Hampstead, N.W.3. Lunt Roberts was married to Hilda Lunt-Roberts (nee Plant), who was born 18 December 1895 and died in Kingston Upon Thames in November 1987, aged 91. They married in Lewisham in 1924. In the 1950s he was an art teached at Lutterworth Grammar School and exhibited with a group of Midlands (mostly Leicester) artists. At the time he was living in the Leicester/Lutterworth area. Dugout Doggerels from Palestine by John N. More. London, Heath Cranton, 1922. Wonderful London To-day by James A. Jones. London, John Long, 1934. London's Eight Millions by James Jones. London, John Long, 1937. Caravan for Three by Ursula Bloom. London, University of London, 1947. Kalee and other stories by F. G. Turnbull. London, Sampson, Low & Marston & Co., 1947. Let's Find Hidden Treasure by Trevor Henley. Bath, Venturebooks, 1947. The Riddle of the Painted Box by Malcolm Saville. London, Noel Carrington, 1947. Redshank's Warning by Malcolm Saville. London, Lutterworth Press, 1948. Two Fair Plaits by Malcolm Saville. London, Lutterworth Press, 1948. Teddy Tail's Book of Children's Songs, musical arrangements by T. J. Hewitt. c.1949. Jimmy by Richmal Crompton. London, George Newnes, 1949. The Flying Fish Adventure by Malcolm Saville. London, John Murray, 1950. Stubby Sees It Through by Angus Macvicar. London, Burke, 1950. Archie Andrews Calling by Archie Andrews. London, Macmillan & Co., 1951. Jimmy Again by Richmal Crompton. London, George Newnes, 1951. The Secret of the Hidden Pool by Malcolm Saville. London, John Murray, 1953. Pete, Pam and Jim, the Investigators by Kathleen Fidler. London, Lutterworth Press, 1954. Rustlers in the New Forest by Judith M. Berrisford. London, Macmillan & Co., 1954. Adventure on the Alm by Nancy Martin. London, Macmillan & Co., 1955. On Guard Spot by Enid Blyton. London, News of the World, 1955. Final Performance by Reginald Masters. London, Macmillan & Co., 1956. Fun and Adventure by Thomas Wright & Mary Wilson. London, Macmillan & Co., 1956. My Own Storybook by Enid Blyton. London, News of the World, 1956. Young Johnnie Bimbo by Malcolm Saville. London, John Murray, 1956. The Fourth Key by Malcolm Saville. London, John Murray, 1957. Just William's Painting Book. London, Publicity Products, 1957. Mystery of Maori Land by John Hornby. London, Macmillan & Co., 1958. With Fuchs and Hillary Across Antarctica by Gerald Bowman. London, Frederick Muller, 1961. Two Stories. The Sire de Maletroit's Door. A loging for the Night by Robert Louis Stevenson, adapted by Linton Stone. London, Macmillan & Co., 1964. With Lewis and Clark Through the Rockies by Gerald Bowman. London, Frederick Muller, 1965. Having never heard of a Mr Lunt Roberts, imaging my surprise at finding a small watercolour hanging on my wall, duly signed R Lunt Roerts - a rather dull, brown seascape. Can I assume that the artist is indeed your Lunt Roberts? I presume it must be as I can't imagine there are any other R. Lunt Roberts' around. I can add that he did lots of illustrations in Wide World magazine around the 50s with that elaborate signature that you illustrate above, but don't mention!